…Only to face disappointment as the game never saw a physical North American release, though it was available on the short-lived Sega Channel. While ROMs of the Japanese and European versions circulated on the Internet via emulation, I never found myself too immersed in the game when playing on an emulator. I am a proud console/retro gamer and it feels too unnatural to play the game on a keyboard in a tactile sense. Hence why I turned to the Virtual Console re-releases for the Wii/Wii U/3DS for my fix of the original three games. However, I found a reproduction cart of the game at the Calgary Comic & Entertainment Expo last year and did not hesitate in buying it. So how does the remake compare to the originals? Say what you want about the Genesis; it may have lacked the sound chip the SNES possessed, but it could send Nintendo packing in the right hands. Listen to Yuzo Koshiro’s soundtrack for Streets of Rage, Masato Nakamura on Sonic the Hedgehog and its sequel—hell, Tommy Tellarico pumped out some good tunes for Global Gladiators and Disney’s Aladdin, which outshone some the SNES’ best music. None of that is present in Wily Wars, which I would describe as serviceable but generic for the Genesis. I like to believe that each Megaman game had its own character. 2 had an exciting, blood-pumping track that made you believe you kick the gate open when you stormed Skull Castle; but it sounded much more subdued when I played Wily Castle 1 in Wily Wars. While the quality varies, the general feel from the music is something I would expect from a middle-of-the-road Genesis game and not something that is of Capcom’s caliber. I suppose I can blame of that and the game’s other “quirks” on its troubled development, which Keiji Inafune described the debugging as a nightmare (according to Megaman Complete Works.) Though I can only speculate, I assume that many of the game’s drawbacks are a result of the developer’s unfamiliarity with the Mega Drive’s hardware. The biggest of them is slowdown, which is very prevalent in the game though it is your saving grace against the Yellow Devil without the classic pause/resume trick from the NES original. Oddly enough, the Wily Wars is easier than the originals in some respects. Remember how a game over meant losing your E-Tanks in Megaman 2? That is not a problem because of Wily Wars’ save feature. 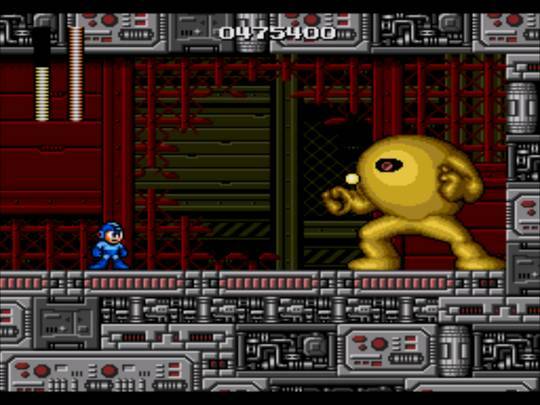 Otherwise, the Wily Wars difficulty is identical to the originals’, even Megaman 1’s unforgiving difficulty. Though what makes Wily Wars a must have for me is the inclusion of Wily Tower. Wily Wars draws many comparisons to Super Mario All-Stars and for good reasons (graphical and audio upgrades), thus Wily Tower functions as the Lost Levels in that it offers extra content. However, unlike Lost Levels, you need to unlock Wily Tower by completing the first three games, which separates the diehards from the casual players. It (and a bout of insomnia) motivated me enough to slog through Wily’s domain in the game: a gauntlet of four robot masters fought consecutively with no health refills with one that can clip off a third of your lifebar in one hit if your jumps are not pixel-perfect. It was worth it so I could mix and match weapons and items from the first three games to use against three new bosses and another Wily castle. Though brief, it feels like the game tosses you a bone for playing through the slowdown. So in the end, was it worth the twenty-year wait to plug it into my Genesis? As a fan of both Sega and Mega Man, I would say yes. More fair weather fans would be better off playing the NES orinals, the devoted can go download the ROMs, and the truly diehard should either import or by a reproduction cart. It is an interesting if not obscure piece of Megaman history that deserves at least one glance.